11/29/2010Share this story on Facebook! Occupational Therapy grad students Marissa Becker and Kelsey Baker fight for their subject's attention in the lab. Photo by Daniel Sitts. 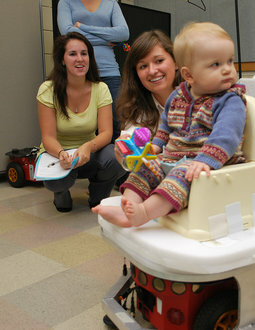 Babies driving robots is only one of the many faculty research projects currently under way at IC. Here is what a few of our professors are working on. Chemistry professor Akiko Fillinger and biochemistry graduate Sarah Fields ’10 have been investigating metal oxide printing patterns in an effort to formulate effective material for solarto- electricity conversion. Music theory professor John W. White analyzes popular music “covers” within a framework of semiotical style change. He recently presented a paper examining Joni Mitchell’s 2000 reworking of her eponymous hit tune from the album Both Sides Now (Reprise) in comparison to her original recorded version from 1969. Physics professor Luke Keller does ongoing research in imaging and spectroscopic instrumentation and in the astrophysics of star formation and planetary system formation. You can read more about his project at www.ithaca.edu/icview. The prototype the team has created consists of a baby seat affixed to a Wii balance board and a basic robot. As the baby leans in the seat, the software recognizes the movements and propels the baby through the environment. The device is also equipped with sonar in order to sense objects in its path so as to avoid crashes. Initial tests involved three healthy infants ranging in age from six to eight months. The researchers hope to develop the apparatus to provide mobility to infants as young as four months old. Infants diagnosed with cerebral palsy, spina bifida, and other impairments will participate in future testing of the device. There is a reason why this device needs to be accessible to children of varying ages, says Professor Dennis. “If you don’t learn something during what’s called a critical period in life, you will never relearn to do it as well later,” she explains. “Babies who aren’t mobile actually don’t develop cognitively and socially as well,” adds Professor Stansfield. A handful of Ithaca College students got the opportunity to assist in this research project. Occupational therapy major Lauren Cresser ’11 has worked on the project for a year now and says that the most exciting part was when she got to work with the infants on the actual robots. This interactive learning process is what she thrives on as an occupational therapy student. “It has been good to learn the many different disciplines and problem-solving skills involved,” she says. Madeline Smith ’10 was one of the students who published a paper about her research and even presented it on behalf of the College last June at a conference in Las Vegas. “Presenting my work as an undergraduate was a great experience, and one that has prepared me for graduate school,” she says. Although this project has a few more years of research and testing, Professor Dennis is optimistic. “If we could even allow a few kids who haven’t been able to move the opportunity to move, that would be wonderful,” she says. So, maybe encouraging the use of video game consoles at a young age is a good thing. Just ask one of the test subjects. Although they may not be quick to answer. They still need to learn to talk, too! Check out video of volunteer babies testing out the robot platform prototype in Professor Dennis's lab at Ithaca College.